Well that's Crufts 2014 over. Not a vintage year in terms of results but we had a great time nevertheless. 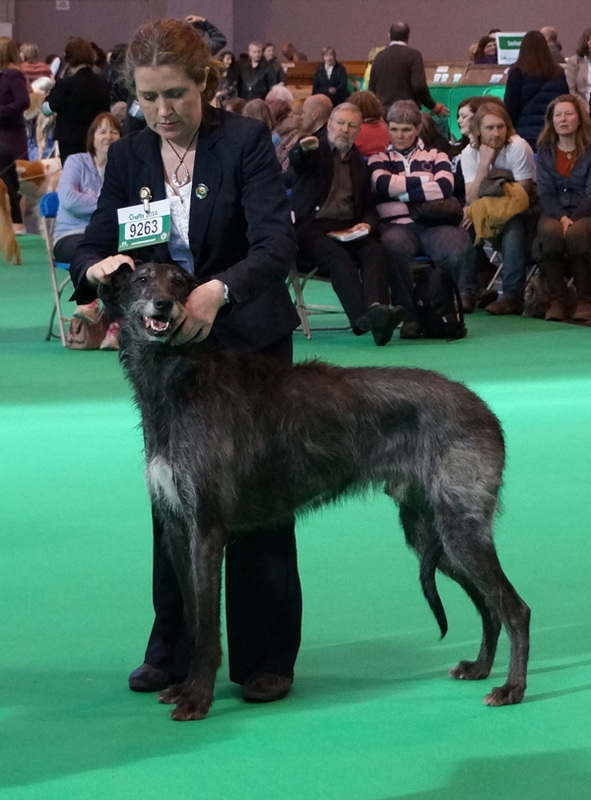 A wonderful highlight was taking Ruairidh (Ruairidh MacRatha of Cusidh***) to his first Crufts. He is our Greyhound outcross boy who in 2012 was registered by the KC under their pilot scheme for dogs of unverified parentage. He had a super time, was impeccably well behaved and was placed V.H.C. in post graduate dog (with 10 dogs present)! Here's the 2014 Crufts Clan Cusidh below. The girls are with Elise - on the far left is Banrigh (Ch Drawing Down the Moon to Cusidh) who after her previous Crufts wins this time formed part of the 2014 support team. She wasn't entered but did try and pass on her hints and tips for success to the youngsters. All listened, apart from Rosie (Cusidh Dreaming Spirit) who is next to Banrigh and who was quite determined not to behave on the day - running all over the place apart from Elise's chosen direction of travel in the ring! Styx (Brylach Over the Broomstick with Cusidh) was the second member of the support team and came away from Crufts with a snazzy new harness and lead set from EzyDog UK. Styx always wears a harness following her incident with a tree! The boys are with Claire. Ronan (Cusidh Homecoming) was there trying to keep his son (Wee Dram) and daughter (Rosie) in check. Ronan was 4th in Limit. Ruairidh, is the middle of the three boys with Wee Dram (Cusidh Drawing Down the Sun), who was 2nd in Special Junior, at the end. And here's Ruairidh in the ring - quite an historic achievement. Well done Ruairidh and congratulations to everyone.